On July 18, 1867, Margaret Tobin (later Brown) made her debut into the world. She was born in Hannibal, Missouri, a bustling town that was growing quickly. The town, founded in 1819, had grown rapidly thanks to the railroad, which was organized in 1846. The Hannibal and St. Joseph Railroad was the first railroad to cross Missouri and was the westernmost line before construction of the Transcontinental Railroad. In addition to being a railroad town, Hannibal was a port town and boasted its own shipyard as well. In 1860, the population of Hannibal was more than 6,000 people. There were nine saloons, seven grocery stores, three hotels, a wagon and carriage factory, nine churches, and one steam sawmill. There were 10 lawyers, two music teachers, two dentists, and two undertakers. But what did the rest of Margaret’s new world look like in 1867? The Civil War had ended less than two years before. Andrew Johnson was the 17th U.S. President. The year 1867 marked the beginning of the Reconstruction Era in the U.S. Around the world it was a time of great invention and change. In January of the year Margaret was born, the Covington–Cincinnati S uspension Bridge opened between Cincinnati, Ohio and Covington, Kentucky, becoming the longest single-span bridge in the world. In 1983, the bridge was renamed after its designer, John A. Roebling. January was also an important moment in African American history. On January 8, Congress overrode a presidential veto that granted voting rights to all men over the age of 21 in Washington D.C., including for the first time, African-American men. February 1867 was an important month culturally. 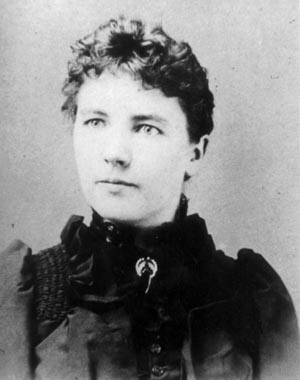 One of America’s favorite authors was born on Februa ry 7: Laura Elizabeth Ingalls, better known as Laura Ingalls Wilder. Her series, Little House on the Prairie, continues to be popular to this day. are well known colors to most Americans. The school has been using these colors for 150 years since a group of students adopted Azure blue and Maize as the school’s colors. The first performance of Johann Strauss’s waltz “The Blue Danube” premiered on February 15th at a concert of the Vienna Men’s Choral Association. Later in the year, Strauss adapted it into the now popular orchestral-only version for the International Exposition in Paris. In March, Congress passed the first two Reconstruction act. The act, known as Military Reconstruction, divided the South into five military districts and gave freedmen (African American men) the right to vote. The first known civil rights demonstration occurred in Charleston, South Carolina on March 27. African American men attempted to ride a street car and refused to get off when the driver told them to. Similar demonstrations were held in April in Charleston and Richmond, Virginia. Major medical advances were announced when Joseph Lister published an article on March 16 in The Lancet, outlining the discovery of antiseptic surgery. Nearly two years after President Lincoln’s assassination, Congress approved the building of the Lincoln Memorial, although construction wouldn’t actually begin until March 1914. The United States grew substantially on March 30 when Alaska was purchased by United States Secretary of State William H. Seward for $7.2 million from Alexander II of Russia. The purchase included 586,412 square miles which was approximately 2 cents per acre. Opponents of the purchase called it “Seward’s Icebox” or “Seward’s Folly”. Opposition quickly subsided in 1896 with the Klondike Gold Strike. On April 1 the Paris International Exhibition (World’s Fair) opens. Between 11-15 million people from around the world visited the Exhibition. The fair ran thru November 3. The fair demonstrated the arts, culture, and technology of the day. One of the inventions on display was reinforced concrete horticultural troughs, created by including Joseph Monier’s. He went on to patent reinforced concrete in July 1867. The oldest known American, Fannie Thomas, was born on April 24. She was 113 years, 283 days when she died in 1981. In May, Alfred Nobel patented dynamite in the United Kingdom. He bequeathed his fortune to creating the Nobel Prizes after reading an obituary which was published prematurely which condemned him for profiting from the sales of arms. On May 29, Queen Victoria signed the British North America Act, which created the Dominion of Canada effective as of July 1. The Atlantic Cable Quartz Lode gold mine was discovered in Montana on June 15. The mine would later yield the largest gold nugget ever found (up to that time), in 1889. The year 1867 was an important one for inventions. In addition to dynamite and reinforced concrete, barbed wire was patented by Ohioan, Lucien B. Smith on June 25. Ready-mixed paint would be patented in July. July is our favorite month because it is when our own Margaret Tobin was born (on July 18)! Also in July, the first elevated railroad in the United States began operating in New York and the Harvard School of Dental Medicine was established as the first dental school in the United States. President Andrew Johnson suspended Secretary of War Edwin Stanton on August 12, defying Congress, in part leading to his impeachment the following January. Johnson was the first president ever to be impeached. General E. R. S. Canby issued an order on September 13 to South Carolina courts which ordered that “all citizens assessed for taxes, and who shall have paid taxes for the current year and who are qualified and have been or may be duly registered as voters, are hereby declared qualified to serve as jurors” which meant that African Americans could now sit on juries and judge whites. Michael O’Laughlen, conspirator in the assassination of Abraham Lincoln, died on September 23 of yellow fever while in prison in Florida. O’Laughlen was one of thousands who died in the Gulf Coast, primarily in Louisiana and Texas, during a Yellow fever outbreak from July to September 1867. The first Medicine Lodge Treaty was signed by southern Great Plains Indian leaders. The treaty required Native American Plains tribes to relocate to a reservation in western Oklahoma. The tribes were assigned reservations of diminished size compared to territories defined in an 1865 treaty. Harper’s Bazaar published its first issue on November 2. It is the longest continuously published fashion magazine in the U.S.
Another important patent that was registered in 1867 was for the refrigerated railroad car. It was patented by J.B. Sutherland of Detroit on November 26. This made the transportation of meat and other perishable food possible over long distances. Territorial legislators voted to move the capitol of Colorado from Golden to Denver on December 9. It passed by a single ballot. Sarah Breedlove, better known as Madam C. J. Walker, was born on December 23. Madame Walker was the first African-American millionaire. She created and sold beauty products specifically for African-Americans. She lived in Denver from July 1905 to September 1906. It was while living in Denver that she changed her name from Sarah Breedlove to something more recognizable: Madam C. J. Walker. Another famous Coloradoan, Simon Guggenheim, U.S. Senator from Colorado from 1907 till 1913, was born December 30 in Pennsylvania. Simon was one of 10 children born to Meyer Guggenheim, patriarch of what would become one of the wealthiest families of the 19th century. The Guggenheim fortune was made through mining and smelting, including in and around Leadville. Simon Guggenheim lived in Denver from 1892-1913. Simon’s older brother Benjamin was aboard the Titanic with Margaret Brown and perished in the disaster. As you can see, the world was a busy an interesting place in 1867! You can read more about Margaret’s early life in Hannibal here.